Prairie Grass Cafe will be hosting a special dinner on Sunday, July 20th to celebrate the official launch of The Green City Market cookbook. The dinner is at 6pm and will feature recipes from the cookbook. The cost for the dinner is $65 plus tax and gratuity. 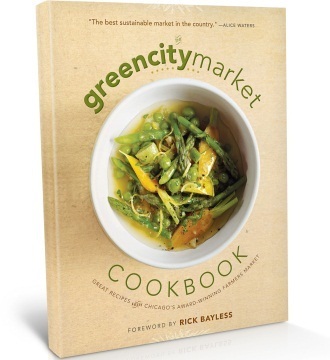 The Green City Market cookbook will be available to purchase for $24.95 and all cookbook proceeds will go the Green City Market. The goal of the cookbook was to inspire readers to cook delicious seasonal food from local farmers markets and to share home cooked meals with family and friends. It’s like a giant recipe swap where professional chefs, customers, and farmers exchange their favorite things to cook with the best ingredients from each season. The Green City Market Cookbook features 88 seasonal recipes based on ingredients from the Market; appetizers, entrees, soups and desserts for each season, and more than 100 delicious photos of the completed dishes and their key ingredient. Each recipe features a short story submitted by the recipe’s author about why the recipe is special to them. Sixty percent of the recipes are focused on fruits and vegetables; 40% use meat, fish and eggs. The cookbook is scheduled for release this July and can be pre-ordered on their website. The July 20 menu will feature recipes from The Green City Market Cookbook summer section.